It was sometime in the late 1970s when Bob Flexner opened his furniture making and restoration shop. Just like any other artisan, he felt immense satisfaction and a deep sense of pride and accomplishment in crafting and restoring furniture; naturally, he became quite good at it. When it came to wood finishing, however, that was a different story. Flexner admits he struggled with finishing for years. A struggle not unlike what many other woodworkers also faced then and still face today. What Flexner discovered was that much of the available information on finishing was contradictory and misleading. He realized this was why he and other woodworkers found finishing so hard to master. This contradictory information came from a number of sources, including the only magazine dedicated to woodworking back then, Fine Woodworking, paint store clerks, finish product reps, and even the instructions written by the manufacturers of finishing products. Flexner knows this all too well. After years of struggling with wood finishing, he began researching the subject at a major university library. There he studied at length the chemistry and technology of all coatings – paints, stains, and finishes. Eventually, he learned to define the various types of finishes and their respective qualities, as well as identify what a finish product really was versus what the manufacturer claimed it to be. In short, he learned to separate the contradictory information, misleading labeling, and even deliberate deception from what was fact. Armed with this knowledge, he went on to become one of the world’s leading authorities on wood finishing. His book, Understanding Wood Finishing, has sold 400,000 copies since being published in 1994. Other books such as Flexner on Finishing and Wood Finishing 101, plus hundreds of magazine articles, followed. To help woodworkers better understand wood finishes and some of the issues surrounding their applications, Flexner commented on some of the wood finishing basics. He defines the term “finish” as a clear, transparent coating that’s applied in liquid form to wood by brushing, spraying, or wiping it on with a cloth. Sometimes, though, “finish” can mean an entire series of coats – meaning stain, one or more coats of clear finish, and maybe some coloring steps in between these coats. A finish benefits wood in two basic ways: protection and decoration. Protection means protection from moisture, either in a liquid or vapor form (humidity), or protection from scratches, dirt, and wear. The thicker the finish, the more moisture-resistant it is. For example, three coats are more protective than one or two. Some finishes, however, offer no significant thickness or protection. That’s the case with wax, boiled linseed oil, and 100% tung oil. Each dries soft and gummy, so all the excess has to be wiped off after each application to maintain a workable surface. Doing this, however, provides insufficient thickness or protection. Decoration means the finish showcases the wood’s natural beauty, color, figure patterns, grain, and depth. It also enhances the wood’s appearance by hiding defects. Paint, too, is a wood finish, but one with enough pigment to hide the wood. Stain is also a wood finish, but one with pigment or dye plus a lot of thinner to make it easy to wipe off. What’s left simply colors the wood rather than hiding it like paint. Deciding which finish to use on a piece of wood depends on several factors. For instance, a woodworker might want to select a particular finish over the others if it offers greater durability, is easier to use, provides either a certain color or no color, dries faster, or emits the least amount of toxic fumes. Durability is the strength of the finish film itself to resist being damaged. 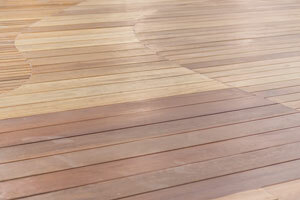 For example, polyurethane, initially introduced in the 1960s as a no-wax floor finish, would be a good durable finish. Since a polyurethane finish dries slowly, it can be brushed on. Alternatives for someone wanting to spray on a durable finish would be to use a pre-catalyzed or catalyzed lacquer or conversion varnish. These are all called catalyzed finishes and are a little bit different than lacquer. Although they have different resins in them, they dry fast like lacquer and are just as durable or even more so than polyurethane. If ease of use is important, then a simple wipe-on finish like Danish oil or an oil varnish blend can be used. A wipe on and wipe off product is much easier to use than working with a brush or a spray gun. Color is another consideration when choosing a finish. Water-based finishes, which are acrylics, give the wood no color nor do they darken as they age. They work well on lighter woods such as maple, birch or pine. If finishing a darker wood, such as walnut, mahogany or cherry, then one of the other finishes such as shellac or lacquer is better. They give the wood somewhat of a yellowish to yellow-orange coloring. They also make the wood look richer and continue to darken as they age. If drying time is important, shellac and lacquer finishes dry the fastest followed by water-based finishes. Varnish and oil take longer to dry, usually overnight in a warm room. Since lacquer dries the fastest, it works great when applied by a spray gun. Shellac and water-based finishes dry fast too, and can be either sprayed or brushed on. Less toxicity can be another factor in selecting a finish. One of the most toxic finishes is lacquer. It requires good ventilation. Some woodworkers find oil-based varnish thinned with paint thinner to be objectionable, but it’s not especially toxic. The least toxic finishes are boiled linseed oil and 100% tung oil. They’re followed by water-based finishes and shellac. As already stated, one of the benefits of applying a wood finish is its protection against moisture and humidity. However, problems could occur if the wood object is not properly dried before adding a finish. TIP: Woodworkers can now easily calculate EMC (and troubleshoot wood moisture problems) using the free Wagner Wood H20 app. There are no complicated on-screen tables or computing – just a quick and simple calculation of necessary temperature and relative humidity for EMC. To download the app, click here. An excellent illustration of this concern for moisture before applying a protective coat is seen in the construction of bowling pins. 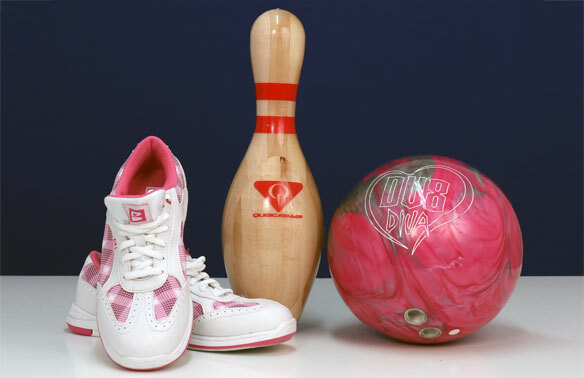 Bowling pins are made of hard maple because of its great strength and distinctive sound when the pins crash. During the manufacturing process, several pieces of the maple are glued together. However, if the maple pieces are not dried to the proper MC, the glued joints would fail and they would fall apart. QubicaAMF Purchasing Manager Chet Moore explains how his company addresses this issue. “Essentially, we glue several pieces of maple together, so they have to be dry enough to be glued. But we don’t dry it quite as low as a furniture maker. We try to keep it at a certain moisture level to optimize the production process and the quality of the pin. But if the correct moisture level is not attained, the glued pieces won’t stay together. That joint will eventually fail,” he says. To prevent this from happening, QubicaAMF uses a Wagner wood moisture meter throughout the kiln drying process. The Wagner meter, highly acclaimed for its accuracy, comes with a special attachment that the kiln operator can slide into the center of the wood bundles before they are placed in the onsite drying kilns. This enables the kiln operator to check the different layers in the bundles as they’re drying. Since the Wagner meter is pinless, it leaves no holes in the maple. Once the wood is dried to the ideal MC level, they can glue the pieces and then coat it with a plastic called Surlyn®. This coating protects the maple from damage and keeps out any unwanted moisture, thereby extending pin life. After an object is made and it’s time to apply a finish, Flexner says the MC of the wood becomes less of an issue; that is, unless the MC is so high (almost wet to the touch) that it causes a problem with the finish. The thicker the finish that’s applied, the better it’s going to resist moisture or humidity exchange, but Flexner cautions woodworkers about applying a finish that’s too thick – typically, more than three coats. What happens is that the finish deteriorates and cracks faster. The exception would be a poured-on epoxy finish – like what some restaurants use on their dining tables. The boards in these tables show no visible shrinkage or expansion because the epoxy finish is so thick that it just stops the change almost entirely. But, of course, epoxy is not a very functional finish for a cabinet or some fine pieces of furniture. While a regular finish can greatly minimize the shrinkage and expansion of wood, the wood will still undergo some movement. This often occurs during the change of seasons or if a piece of furniture is moved from a very dry location, like Phoenix, to a much more humid locale, like Miami, or vice versa. For example, in winter and summer, when the air is drier due to a heater or air conditioner running, the wood shrinks. In the fall and spring, when HVAC units may not be on or when windows are left open, the wood can expand but again, not to the extent that it normally would if there were no finish on the wood. Flexner also notes that the first coat of any finish seals the wood. In effect, the finish stops up the pores in the wood so that the next coat of finish, or any other liquid for that matter, doesn’t penetrate easily. This first application of finish raises the wood’s grain so that it feels rough. Rubbing sandpaper lightly over the rough surface will make it feel smooth. Nothing else needs to be done to the wood unless, after this first coat, one of two issues need to be addressed. The first issue involves the use of alkyd varnish and lacquer. They gum up sandpaper when the wood is sanded, so a sanding sealer will be needed. Flexner notes that sanding sealers weaken the finish and should be used only when finishing a large project or doing production work. The second issue may involve problems in the wood such as resinous knots in softwoods. This problem can be corrected by using shellac for the first coat. 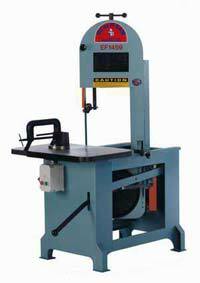 Obviously, this article only skims the surface of all there is to know about wood finishing. For anyone wanting a more in-depth coverage of finishing, read Flexner’s book Understanding Wood Finishing. For the amateur woodworker or someone wanting to do basic finishing, Flexner’s book Wood Finishing 101 would be ideal. It’s not as comprehensive as Understanding Wood Finishing, but it comes with plenty of photos and step-by-step illustrations. We have two whiskey barrels that we are going to use for out master bathroom vanitys. They are not sealed at the moment and do quite a bit of shrinking and the bands come loose so much so that they fall to the floor. Any advice would be much appreciated as to what we can do to keep the MC where the bands will stay tight. Thank you in advance. When in use, whiskey barrels are very moist throughout. As you know, when wood is wet it expands and it shrinks when dried out. The only way to keep the original bands is to introduce more water/moisture into the wood of the barrel. This high moisture would be difficult to maintain in a dry house environment. It may be easier to use smaller bands. By using a moisture meter throughout the process of staining and finishing furniture, many moisture-related problems can be avoided. There are many factors that can affect drying times for a stain. Higher relative humidity (RH), high moisture content (MC) of the wood, and lower temperatures can add to the drying time. As for the staining of the books, this can also be caused by a finish failure due to not using enough coats or not allowing sufficient drying times between coats. We recently had new red oak installed in our house, which was stained and had a second clear coat applied Sunday afternoon. I’d like to move the furniture back into the newly floored rooms on Tuesday afternoon, two days later. Will the weight of the furniture have any ill-effect on the finish? Or is two days enough time to wait to refurnish the rooms? I would suggest that you check with the installer, or with the clear coat manufacturer. I’m finishing a brand new pantry in a small room with a window that is very drafty. I stained the entire room. It’s made of old reclaimed pine. I usually use varnishes. I’m going to use the new varnish from Fine Finishes of Europe. We’ve got some hot and humid weather coming. 90 degrees and very humid. I bought a MC meter and a meter for the room’s dew point, humidity and temp. What would be an ok room humidity level to apply my varnish. The wood is dry. A general guideline for safe varnishing conditions is 50 to 80 degrees Fahrenheit and 45 to 55 percent humidity. Always a good idea to check with the manufacturer of the varnish as well. I am refinishing six panel interior pine doors that have experienced some nicks and bruises. The doors, which are more than twenty years old, have a nearly natural finish that is a rich umber color with a nearly flat finish. I’ve found that over sanding damaged areas cuts down through the finish to the much whiter surface on some of the lighter pine. I would like to avoid sanding as much as possible, but it is deemed necessary in areas and I’m seeking recommendations for a ‘yellowing’ fast dry finish that is nearly flat. I’ve tried several finishes and had the best finish results with Minwax Water Based Polycrylic – Clear Matte. We can live with the fact that the Clear Matte is not as flat a finish as our doors currently have, but this product has no yellowing, so some of the sanded areas stick out like a sore thumb. I have twenty doors that need some level of attention, but full restoration of all these doors really isn’t in my scope of desire. I am trying to replicate the cracked finish on an old commercial oak display case for pieces that need to be replaced which were missing.I would like to be able to match both color and the fine cracking. What would you suggest? Because of the complexities involved with wood finishing, I recommend getting Bob’s book called “Understanding Wood Finishing”. I’m going to finish a piece of furniture with finishing oil (called Liberon Finishing Oil), but it seems to contain a lot of solvents, so I’d prefer to do it outside, and let it dry outside over night. There will be a roof above to protect from rain. Only problem is, after an almost completely dry summer, suddenly we are getting rapidly changing weather in my town (Oslo), alternating between dry and humid, with occasional periods of rain. It’s easy to get perfect conditions at the time of applying the first coat, but during the night there will be lower temperatures, down to 10 degrees celsius (50 F), and humidity up to 95%. Can this be a problem, or will it be sufficiently sealed after the first coat has died for about 5-6 hours in ideal conditions, so that is less of an issue? The first coat should be enough to prevent moisture from absorbing into the wood, especially since it is just for one night. It typically takes many days for furniture-grade wood to absorb enough moisture to be a problem. We are starting to import furniture from Indonesia. Mostly large suar wood slabs and suar and recycled teak furniture. I have been doing alot of research on RH and it’s effects of furniture. I have also been speaking to alot of different people, all of whom seem to have different opinions. Our company is located in Florida and will be selling across the US. We currently keep our inventory in a non climate controlled warehouse. 1. I have been told by some to get the MC down to about 5 or 6% to avoid mold issues, but now after reading your article I am concerned about this. Would it make more sense to dry it down to 6 to 8%, even though we are in Florida or 12 to 13%? 2. Since our warehouse is not climate controlled do you suspect this to be a problem? 3. We are going a step above (at least I think we are from research and experience) and having the finisher in Indonesia use varnish instead of melamine as they typically use. The varnish will be applied in 2 coats with sanding in between. This is costing me extra to do, but I think it is well worth it. 4. Would it be better to leave the RH lower to allow expansion just in case or to keep it high with the risk of contraction? 5. Which tester would you recommend for this type of application? Mike, Wood will swell or shrink when gaining or losing moisture. This can be a problem if it is made into a finished product. Since Florida has high humidity, the target moisture content is higher than other parts of the country. This is not a problem as long as the wood is acclimated to the proper moisture content of the environment it will be in. Wagner has an APP for this called “WoodH2O”. This will calculate the proper moisture content given ambient conditions. Also, see our new line of Orion meters. Is dried water based lacquer toxic when scratched off and eaten? If you’re not sure, can you suggest a way to find out ? This national hotline number will let you talk to experts in poisoning. This is a free and confidential service. All local poison control centers in the United States use this national number. You should call if you have any questions about poisoning or poison prevention. You can call 24 hours a day, 7 days a week, 365 days a year. For more information, contact the American Association of Poison Control Centers – http://www.aapcc.org.